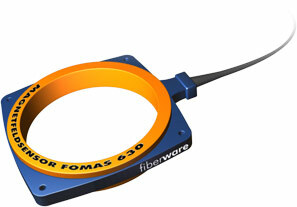 fiberware offers a new product to meet the unique requirements of an advanced sensor and extended technical applications. A new current measurement device, that works contactless on the basis of the FARRADAY EFFECT, was developed. Particularly for time dependent processes, the current sensor proves to be an ideal measurement device. It is very easy to introduce the sensor into existing apparatus, because the sensor head is very flexible speciality optical fiber. electromagnetic interference or high voltage problems. The plan of polarisation of linearly polarised light traversing a medium is rotated by the magnetic field component along the direction of light propagation. If the sensing fiber completely surrounds a net current I the Farraday effect rotation F can be written F = n V I, where n is the number of fiber turns and V the Verdet constant in appropriate units 4.7 10-6 rad/Ampere. In optical fibers to get a high accuracy in measurement of polarisation rotation is greatly complicated by the changes in the state of polarisation of the light probageting through the fiber, because of the inavitable presence of the birefringence in the fiber. The elemination of this Distortions in a speciality fiber is the innovation of the product.